Nothing is more sacred for a Catholic than the Holy Eucharist. Thus, any insult to the Eucharist is something that concerns all Catholics, particularly when someone receives Holy Communion to challenge Church laws or show great disrespect. Unfortunately, such public challenges and grave disrespect to the Blessed Sacrament are happening ever more frequently. This could be seen in the case last year when two homosexuals, cross-dressing as nuns, received Holy Communion from Archbishop Niederauer of San Francisco. 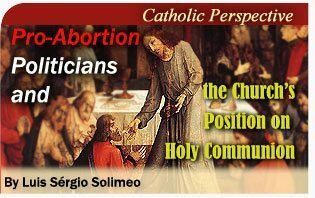 Finally, there was the media-announced and actual receiving of Holy Communion during the recent Papal Masses by prominent politicians publicly opposed to Catholic doctrine on abortion. Such scandalous actions appear to be a calculated challenge to Church laws. To make matters worse, House Speaker Nancy Pelosi was quoted in the media defining the Holy Eucharist in a way that does not reflect Church teaching. Without denying the negative consequences of these politicians’ acts, it must be noted that — regardless of Mr. Allen’s opinion to the contrary — the doctrinal position of the bishops opposed to giving Holy Communion to pro-abortionists remains entirely solid, since it is based on immutable moral principles. Furthermore, when still Prefect for the Congregation for the Doctrine of the Faith, in a memorandum dated July 3, 2004 to the American bishops gathered in Denver, Colorado for their semi-annual meeting, Joseph Cardinal Ratzinger clearly recalled these principles. • “Regarding the grave sin of abortion or euthanasia, when a person’s formal cooperation becomes manifest (understood, in the case of a Catholic politician, as his consistently campaigning and voting for permissive abortion and euthanasia laws), his Pastor should meet with him, instructing him about the Church’s teaching, informing him that he is not to present himself for Holy Communion until he brings to an end the objective situation of sin, and warning him that he will otherwise be denied the Eucharist. Thus, the rules are very clear. Contrary to media reports, the politicians’ challenge will continue to be met by the twenty or so bishops who have courageously manifested their position on this matter, especially Archbishop Raymond Burke of St. Louis and Bishop Michael J. Sheridan of Colorado Springs. On the part of the politicians, it seems strange that politicians who one would think want to attract the Catholic vote this election year would choose to show such public disrespect for that which the Church holds most sacred. Dom Gregory Manise, O.S.B, Communion, Holy, in Francesco Cardinal Roberti-Monsignor Pietro Plazzini, Dictionary of Moral Theology, The Newman Press, Westminster, Maryland, 1962, pp. 259-260. Cf. Luiz Sérgio Solimeo, Sacrilege, Scandal and Homosexual Ideology in San Francisco, https://www.tfp.org/index.php?option=com_content&task=view&id=551&Itemid=73; Protest a Lewd Homosexual Blasphemy at Vienna’s Diocesan Museum, March 28, 2008, https://www.tfp.org/cc/index.php?option=com_content&task=view&id=793&Itemid=50 ; infra note 3. Mike Soraghan, Pelosi takes Communion at papal Mass, http://thehill.com/leading-the-news/pelosi-takes-communion-at-papal-mass-2008-04-17.html. John L Allen Jr., “No hard line from pope on communion for pro-choice pols,” National Catholic Reporter, Apr 20 2008, http://ncrcafe.org/node/1749. Cf. Worthiness to Receive Holy Communion. General Principles, by Joseph Ratzinger, http://chiesa.espresso.repubblica.it/articolo/7055?eng=y.